Time to build a compost bin. Last spring our composter fell apart. It was very old and the wood had rotted away. As I only had the one, I was always having to take the uncomposted material off the top to get at the good stuff at the bottom. Not an ideal situation. So looking for another solution we took a piece off a roll of wire fencing (fencing is called Everbilt 2″x4″ openings) and made it into a circle. Put some landscaping cloth on the bottom and set it on top. Then we put a smaller gauge wire around (half inch holes) it to keep stuff in and hopefully keep the rats from making a nest in the warmth. After that, we put landscaping cloth around the outside to keep the heat in and also to contain the contents. 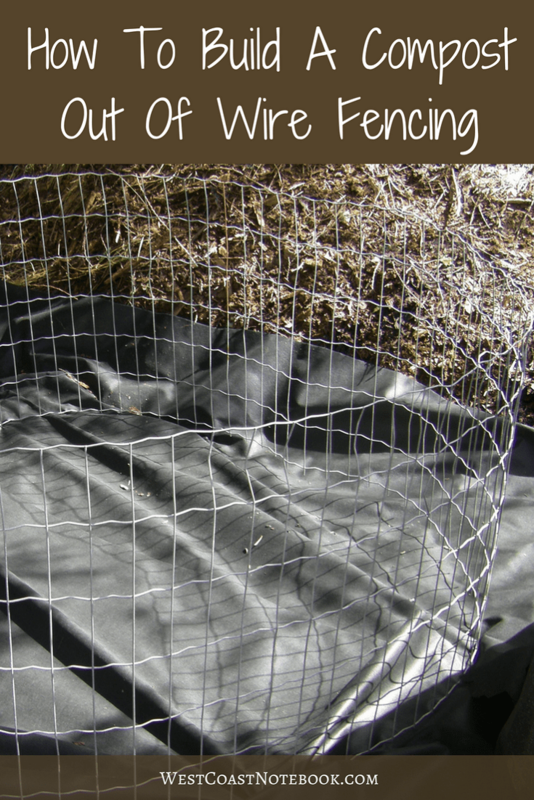 It actually worked very well, except for I still only had one compost and the wire around it was 4 ft high. This meant that the only way I could turn or get at the compost was to stand on a ladder which wasn’t going to happen. And because it was so tall and I couldn’t turn it we put in drainage pipes on rebar. This was so air and water could get down into the compost and keep it wet and aerated. So in order to get at and use the lovely compost that was made earlier, I was going to have to take it apart and create something new. First taking off the landscaping cloth and then the small gauge wire, I cleaned up around the edges of the existing compost and put it into a garbage pail. 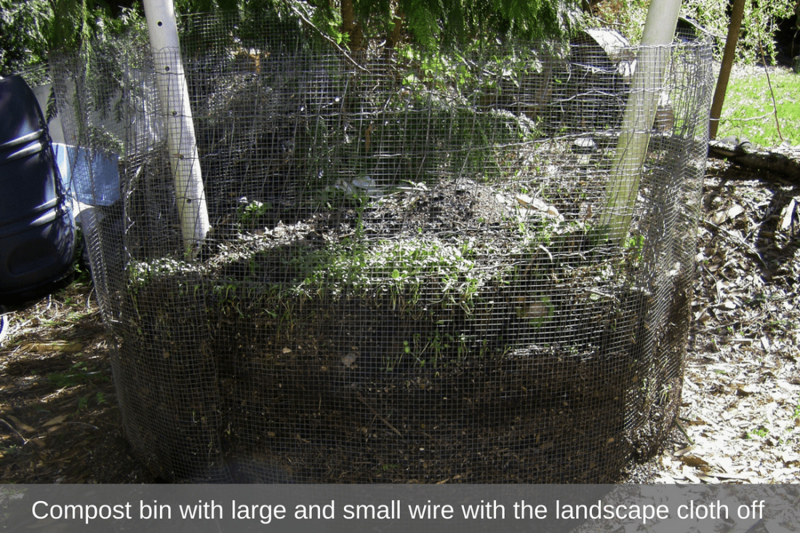 Then taking off the wire the compost was now free standing. Holds together well. 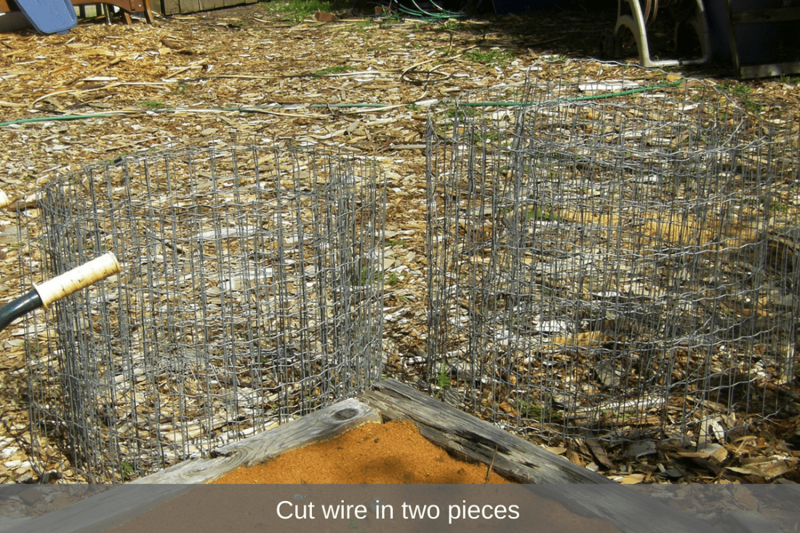 Taking a small grinder we cut the wire in half and we formed them into two circles 2 ft high and 5 ft in diameter. One circle of wire went around the existing compost and then we put down some more landscape cloth and set the new circle of wire on it. The circles are just held together with wire top and bottom. 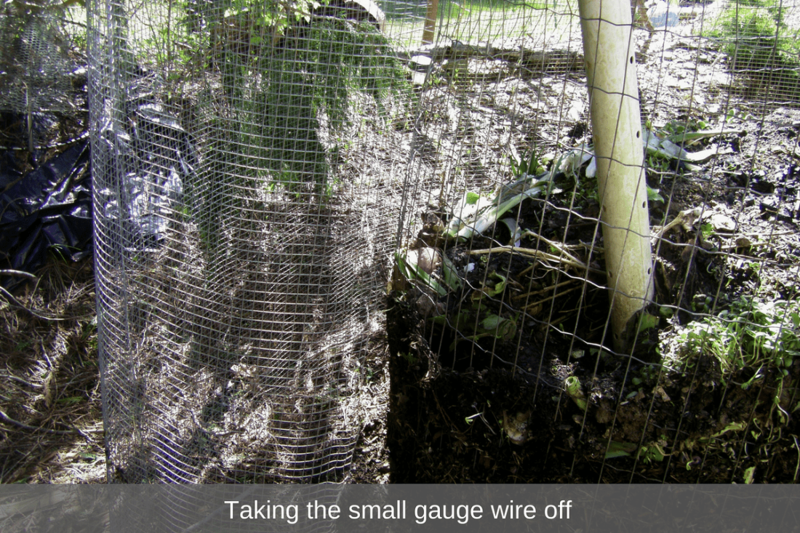 We didn’t use the small gauge wire this time, we just put landscape cloth around each of the wire circles. Leaving some laying on the ground we put bark mulch on it to hold it in and then draping it over the top, attached the ends of the cloth to wire with a twist tie to hold it in place. Now… I had two composts, one full and the other empty. 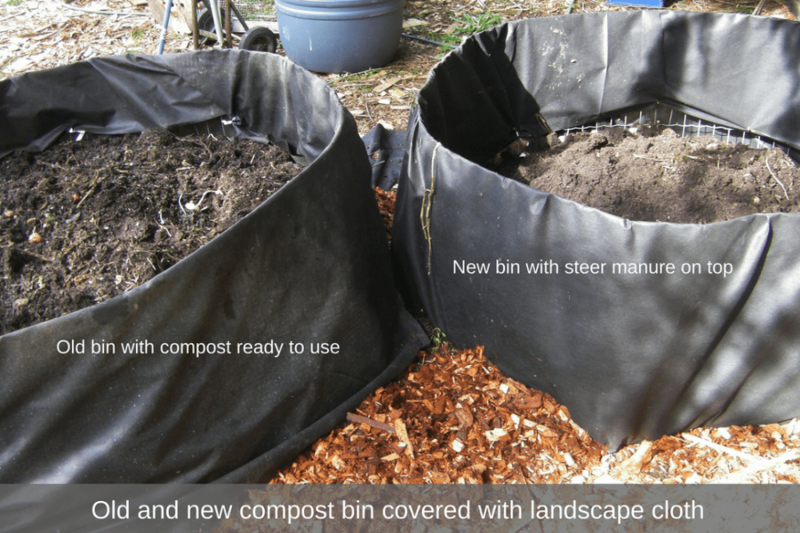 With a garden fork, we moved all the top, uncomposted soil to the new bin. It is amazing what doesn’t get broken down. Corn stalks were almost the same composition as when they were put in, and the tomatoes stalks were slow to disintegrate as well. Taking out the corn stalks entirely, we took the old bin down to where most everything was composted and the new bin was about a third full. Next, we put a couple of bags of steer manure in the new bin on top of the everything just to get it going and heating up again. What was left is the most compost that I’ve ever had to put on the plants. The black cloth around the outside really held the heat in and the resulting earth is dark and moist and full of worms. No matter how much things get composted down, there are still a few things that take a little longer so I always screen the compost before I used it. Remember the garbage pail that I used to put all the excess compost from around the edges of the bin? Well, I took that and screened it as I had a use for it in the garden. To screen, I have some small gauge wire (half inch openings) on a frame. I have no idea where it came from, but it would be easy to put something like this together. 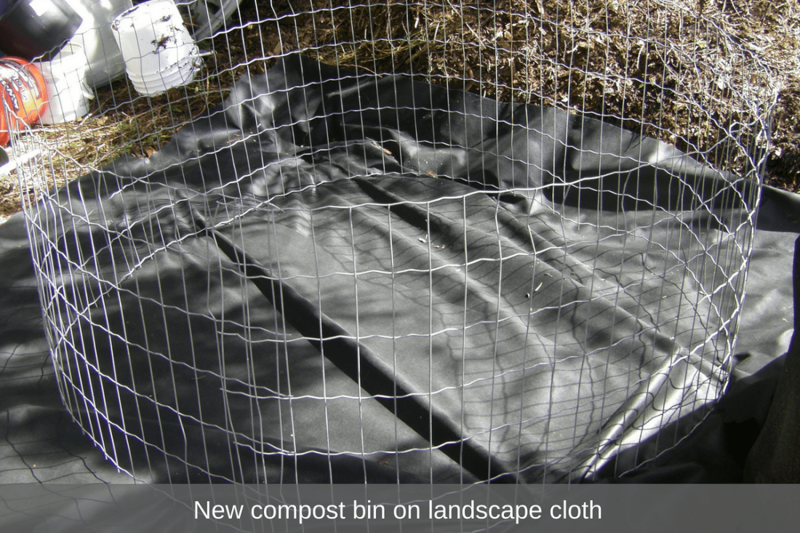 Getting out the wheelbarrow I place the screen on top of it and then shovel the compost onto it and spread it around. 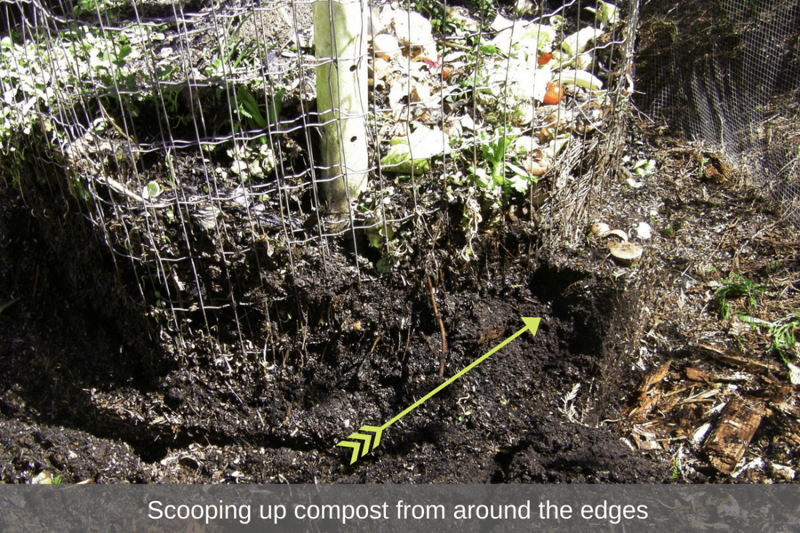 The good stuff falls into the wheelbarrow and the odd bits that didn’t decompose go into the new compost bin. This makes wonderful soil with lots of nutrients and by screening, it aerates it as well so there are no clumps. If I don’t use it right away, I just put it into an empty garbage pail and keep it on hand for when needed. It is going to be such a treat to be able to grab the compost right out of the bin and screen it as I need it and to have the option of being able to use one bin while the other is cooking. Two projects done and completed this weekend. The rose garden and the compost.